Life can be a bit too predictable sometimes. You slip into a comfortable routine, and months are gone in the blink of an eye – leaving you dazed and confused as to where the time went. 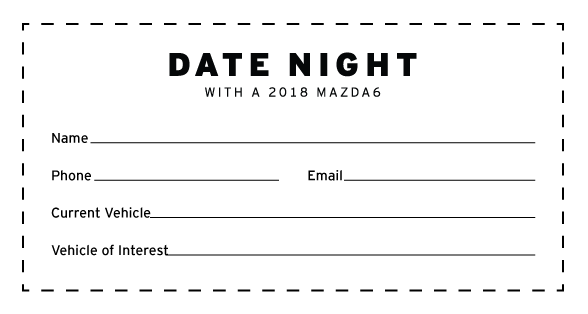 At Morrie’s Inver Grove Heights Mazda, we love our clients so much that we want to offer you a night out on the town that’s sure to get your heart racing – and remind you that a little spontaneity never hurt anyone! We’ll provide the winner with 24 hours behind the wheel of a 2018 Mazda6 and $150 to use at Chino Latino, Manny’s, or any other Parasol Group Restaurant of your choice! Simply download the entry form below, fill in your information, print and cut it out, then bring it to Morrie’s Inver Grove Heights Mazda before 5:00 PM on June 30th. We’ll provide the winner with 24 hours in a 2018 Mazda6 and $150 to use at Chino Latino, Manny’s, or any other Parasol Group Restaurant of your choice!